Goal: Test WiFi Multicast Download. 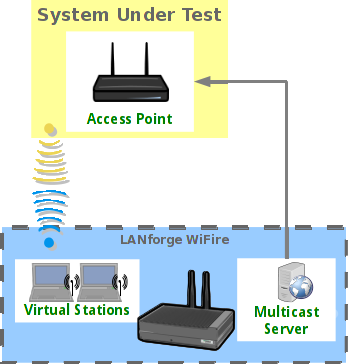 Test WiFi Multicast Download with a small number of stations. This example uses a pair of LANforge CT520 systems, but the procedure should work on all CT521, CT522, CT523 and CT525 systems. Multicast is a bit special in Wireless networks. Packets are normally transmitted at the lowest rate, so even a small bit of multicast traffic will slow down the entire network. In this example, we will transmit multicast frames from the AP to the stations. Many users will instead use the wired Ethernet port as the transmitter, but aside from the different port, the procedure should be the same. This example assumes you have already created and configured the desired amount of WiFi station interfaces. Go to the L3 Endps tab, and click Create. Set the IGMP Addr, IGMP Dest Port, name, PDU Size, Port, etc and click OK when done. Go to the L3 Endps tab, and click Create. Set the IGMP Addr, Min IP Port, name, Port. The IGMP Addr and IP Port should match the transmitter. Make sure you also select the 'Rcv Mcast' checkbox. Click Apply when done. You can then change the name, change the Port, and click Apply again to create a duplicate endpoint on another station interface. 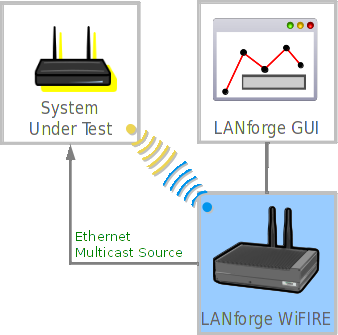 Select the Multicast transmitter and receiver endpoints on the L3 Endps tab and click Start. Observe transmit and receive rates, packet-loss, and other statistics to very performance is at expected value.